Movin' on up! We have raised the height of our popular Relaxer so everyone can enjoy the benefits of this comfortable recliner. The Raised Relaxer offers the same comfortable position to relieve stress and distribute the body weight evenly but now it is easier to get on and off. 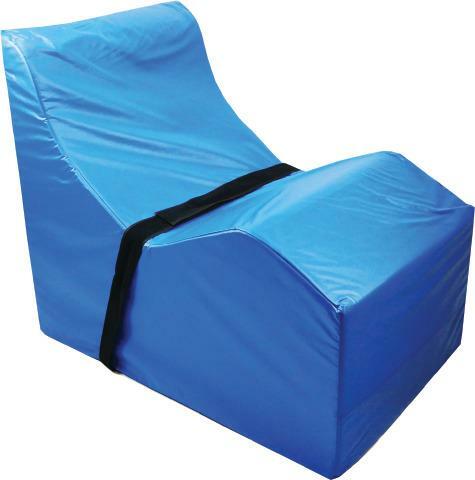 Transfers are now much easier for those who find it difficult to sit in our Regular Relaxer Positioning Chair. We've made the Raised Relaxer wider to a more secure feeling. It is now 30" wide as opposed to 25" wide. Includes an adjustable Velcro seat belt for added security Truck Shipment. Loading dock or Liftgate/Inside Delivery necessary to receive shipment. Please contact customer service at 800-467-6222 for a quote. Dimensions: L: 47" x W: 30" x H: 40"